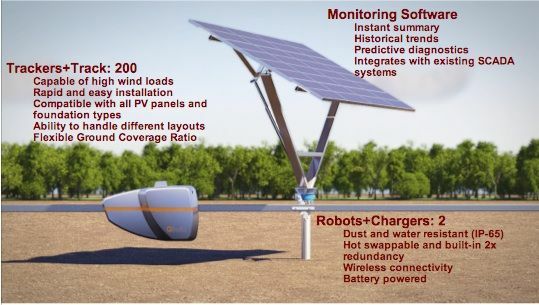 QBotix has a genuinely innovative solar solution that maximizes output and could lower balance-of-system costs in ground-mounted PV installations. The startup has invented a two-axis tracker system where the motors, instead of being installed two per tracker, are moved around by a rail-mounted robot that adjusts each tracker every 40 minutes, resulting in an enormous reduction in the number of (failure-prone) motors. 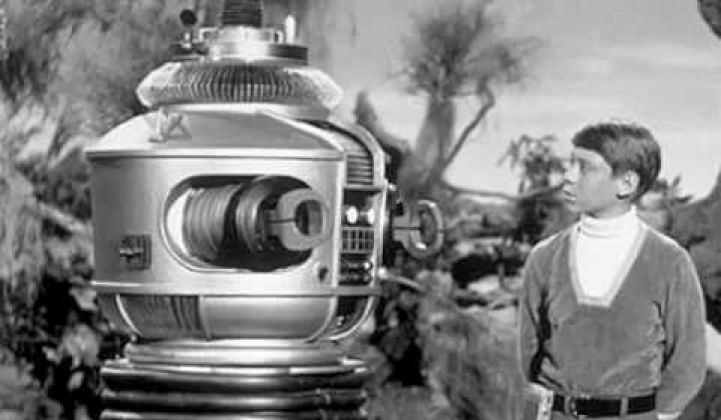 The robot visits each assembly, adjusts the angle and tilt, and moves to the next pole. When its job is done, it parks itself in a little hut and dreams of electric sheep. 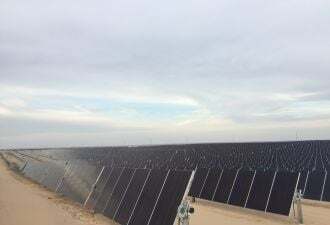 There's no doubt that single-axis trackers add value to a solar farm -- tracking the sun east to west can improve kilowatt-hours produced by up to 25 percent, as well as spreading generation over a wider period of time. Two-axis trackers can improve output by up to 45 percent over fixed tilt, according to the firm, but have been prohibitively expensive and come with questionable reliability. One rarely sees two-axis trackers in utility deployments except in concentrated photovoltaic (CPV) plants. 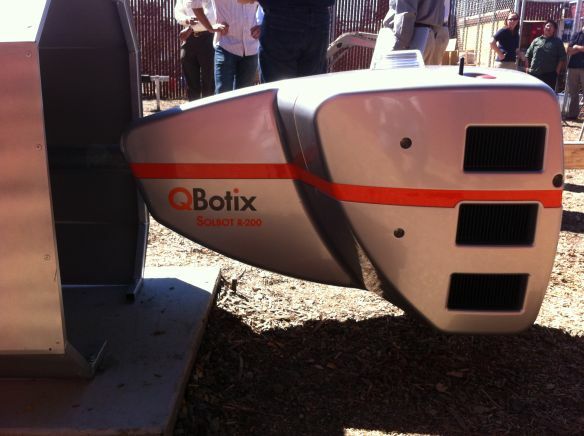 QBotix's product is the racking, tracking, and monitoring portion of a solar farm. That's about one-fourth of the ingredient cost of a solar farm, according to a company source. The firm has a test deployment in Menlo Park, California, and claims it will have its first commercial deployment this month. Initial deployments could emerge as 300-kilowatt test deployments as part of larger solar power plants. Other tracker manufacturers include Array Technologies, SPG Solar, Sedona Energy Labs, and PV Trackers. Solaria builds a solar panel and tracker combo, as well. In January 2011, First Solar (Nasdaq:FSLR) announced the acquisition of RayTracker, a VC-funded manufacturer of utility-grade single-axis trackers. Although the terms of the acquisition were not disclosed, we later learned from Kang Sun, the founder of the tracker company, that First Solar paid approximately $45 million for the tracker firm, which had received $3.5 million in venture funding from Idealab and The Quercus Trust. Let's assume that the QBotix tracker technology works accurately and reliably. Bokhari says that QBotix will match the installed price of any single-axis tracker product. A company source noted that the labor cost to install and wire the QBotix trackers at the test site was on par with current single-axis tracker labor costs for larger volume sites. So, let's assume that the company can achieve cost parity with single-axis trackers. How does QBotix get this new product deployed in commercial solar fields with conservative engineering, procurement and construction (EPC) firms as customers -- and even more conservative banks backing the solar projects? How does a tiny VC-funded firm back up its product in a fashion that quells the doubts of its staid channel partners? Having Siemens as an investor (or potential customer) will help, but QBotix remains a technological departure for developers and financiers. And those parties will need to be convinced. Notable EIR and permitting tussles at solar farms by First Solar, SunPower (Kit Fox, Giant Kangaroo Rat, etc. ), and BrightSource (Tortoises, Hawks, etc.) suggest that robots zipping through field and desert will provide hours of wildlife habitat study amusement for QBotix and its customers. Elegant, innovative, and smart, QBotix now has to sell EPCs on its new concept -- and it's not just a technological sell. QBotix is a rare recent example of early-stage solar investing by venture capitalists -- in this case with $7.5 million from Firelake, NEA, DFJ JAIC, Siemens Ventures, and angel investors.